The symbolism,iconography and meanings behind the Buddha Image. The Buddha images we sell have a long and venerable heritage and are carved with reverence and a deep significance - here we explain the iconography and the significance of the features of each unique piece. The first statues and busts of the Buddha were made in the Kandahar region of Afghanistan. Their makers were either descendants of Greeks who settled in the after Alexander the Great’s arrival or were influenced by Hellenistic styles. Before any such statues were made, the Buddha was symbolised by the Dharma Wheel or a stupa. The first Buddhas were made nearly 300 years after his death. Although the holy texts and canons have some information about his looks little is known of their exact authorship and when they were written. Some statues and heads exist where the Buddha has a moustache which was common on men of high status at that time. Later though the Buddha is always shown clean shaven and without a beard or moustache. In the Pali Scriptures a writing is shown many times which records how the Buddha began his quest for enlightenment. "So, at a later time, while still a young black-haired young man endowed with the blessings of youth and in the first stage of my life — and while my parents, unwilling, were crying - I shaved off my hair and beard, put on the saffron robe and went forth from my home life to that of being homeless". The art of Buddhism began in India and followed the life of present Buddha Siddhartha Gautama, 6th to 5th century BC, and adapted and incorporated other styles it travelled from India to throughout the world. Very early Buddhist art was in the Indian tradition of not depicting the human form. About 100 years BC though the style changed to one of representing the Buddha in his human form and it is a style that has continued down the ages to the present day. Buddhist art followed in the path of its adherents as the religion took root in each new country. It’s art and religion travelled north through Central Asia and then into Eastern Asia to create the Northern branch of Buddhist art, and simultaneously to the east and as far as SE Asia to create the Southern branch of Buddhist art. Particularly in India Buddhist art was hugely popular and influenced the development of Hindu art. The decline of Buddhist art and its influence began around the 10th century partly owing to the vigorous expansion of Islam and Hinduism. From the 100 to 600 A.D Buddhist art in Thailand was initially influenced by having direct contact with Indian merchants and the subsequent expansion of the Mon kingdom. This resulted in the creation of Hindu and Buddhist art derived from the Gupta tradition, with numerous monumental statues of great style and elegance. Starting at the beginning of the 9th century various schools of Thai art began to be hugely influenced by Cambodian Khmer art in the north and Sri Vijaya art in the south both of which came from the Mahayana faith. Until the end of that period, Thai Buddhist art has a clear fluidity in the expression, and the types of images chosen were characteristic of the Mahayana pantheistic beliefs with multiple creations of Bodhisattvas. 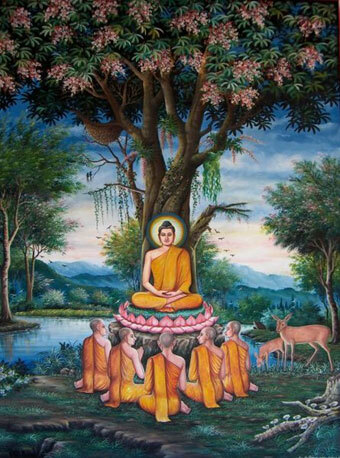 With the start of the 13th century, Theravada Buddhism came into Thailand from Sri Lanka and at the same time the ethnic Thai kingdom of Sukhothai was founded. This new belief gave rise to some highly stylized images in Thai Buddhist art. During the Ayutthaya period (1300 - 1700), the Buddha images were represented in a more stylistic fashion with robes and jewelled ornamental. Many Thai sculptures and temples were gilded, and sometimes enriched with inlays. Buddhism started in India and so many of its early symbols are related to ancient India and Hinduism as well though their original meaning were often changed. Buddha lived around the sixth century BC but no Buddhist artefacts or statues have been found from before the third century BC. 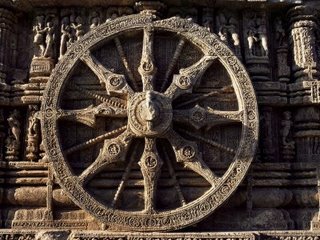 Buddhist scriptures mention that the Buddha did sometimes use images like the 'Wheel of Life' to illuminate teachings.The first archaeological evidence, which is of ornamental stone carvings and statues, comes from that of Emperor Asoka who lived from 273 - 232 BC. He was the first major convert to Buddhism and thus helped popularise the religion in India and beyond. In the second century BC, converts started to build Buddhist monasteries carved out of rock, thus creating a large amount of highly durable artwork. 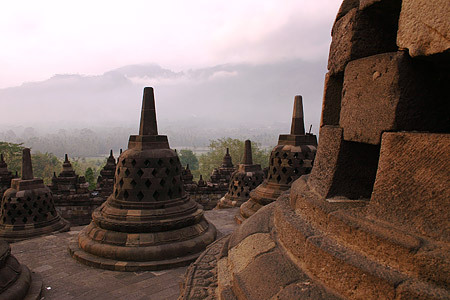 The earliest Buddhist monument is the stupa, which was often highly decorated decorated. The earliest actual human form Buddha image statues appeared in the first century BC, until then the artwork had been largely symbolic in nature.Buddhist Tantra in the 6th century AD created an avalanche of new artwork and symbolism with imagination and visualization forming a major technique in the practice of meditation. It was at this time that a multitude of statues of gods and protectors appeared, alongside a huge collection of symbolic objects, such as the vajra and bell, mandalas and other items. Some of the earliest Buddhist texts from the 1st century BCE, list 32 different physical attributes of the Buddha. Some of these are quite poetic such as "legs like an antelope's” or "ankles like rounded shells" whilst others are specific such as depictions of his feet with level tread, projecting heels, long and slender fingers and toes, and a tuft of hair protruding between his eyebrows. It is not required that such Buddha images reflect all of these attributes, many of them have acquired a deeply religious and iconic status. The Buddha is also said to have had a protuberance or bump on the top of his head referred to as the usnīsa. This is sometimes represented as a spike, and sometimes only as a small bump. The Buddha always has a serene demeanour or faint smile. The Buddha is always depicted with very long ear-lobes. This is thought because in his earlier life as a prince he had worn heavy earrings, but this has now has come to symbolize his wisdom. The styles of Buddha in Laos and Thailand are quite distinct. These relate to specific episodes of his life, some of these are considered particularly auspicious for those born on particular days of the week. The heroic posture with the legs folded over each other. The adamantine posture with the legs crossed so that the soles of both feet are turned up. The Buddha is nearly always shown wearing a monk's robe, of the type worn by contemporary Buddhist monks today. It may be worn in the covering mode, in which it is draped over both shoulders or open mode - leaving the right shoulder and breast uncovered. The robe is a representation of the Buddha's earthly humility as the Buddha was originally a prince, who renounced the world in order to seek enlightenment, and his original robe was made from the shroud of a dead body.The robe is sometimes shown as transparent or billowing mysteriously, suggesting his spiritual power. Buddha images are often covered with real robes, which are periodically periodically which usually coincides with major Buddhist festivals. The most important aspect of the iconography of the Buddha is gestures made with the hands which are known in Pali as mudrā. These gestures are usually associated with particular incidents that took place in Buddha’s life. Touching the earth - the right hand rests on the right thigh with the fingers pointing downwards and touching the earth the left hand rests in the Buddha's lap. This mudrā is frequently called "calling the earth to witness” - the gesture symbolises the Buddha's renunciation of worldly desires, and as this is the central moral precept of Buddhism is by far the most common depiction. Meditation – both of the hands are shown lying flat in the Buddha's lap, palms displayed upwards. This mudrā is usually associated with a seated Buddha. It shows that the Buddha is disciplining his mind through deep meditation, a necessary step to on the road to enlightenment. Charity - the right arm is shown extended downwards, with the open palm turned to the front and the fingers extended. This 'mudrā is usually associated with a standing Buddha. This position can signify either that the Buddha is granting or receiving alms from his followers. Absence of fear - either one or both arms are shown bent at the elbow and the wrist, with the palm facing outwards and the fingers pointing upwards. It shows the Buddha either displaying fearlessness in the face of adversity, or encouraging others to do so. The right hand raised is also referred to as "calming animals" and both hands raised are also called "forbidding the relatives". These 'mudrās are usually associated with a standing Buddha, but sitting Buddha variants are also quite common. Reasoning and exposition - the arm and hand are positioned in the same manner as in the Absence of Fear except that the thumb and forefinger are brought together. The gesture can be made with either the right or left hand but not both. This mudra signifies an appeal to reason. Since the Buddha is appealing to reason, this gesture often represents an appeal for peace. Setting the wheel in motion - the hands are held in front of the chest, with both hands in the resting position, with the fingers of the left hand resting in the palm of the right hand. This is a less common as it refers to a particular episode in the Buddha's life - his first sermon, when he set the wheel of his life's work in motion. It is used for both seated and standing representations. Over the centuries combinations and variations of these six different appearances have evolved. As artists depicted more specific incidents in the life of the Buddha, new, secondary mudrās were created, such as "The Buddha holding an alms bowl" and “The Buddha receiving a mango" and the Buddha performing various miracles. Footprints of the Buddha exist in many Buddhist countries including Afghanistan, Cambodia, China, India, Japan, Korea, Laos, Malaysia, Pakistan, Singapore, Sri Lanka, Thailand and Burma. They vary considerably from country to country and take their inspiration from source texts used of the dominant schools of Buddhism operating at these times. Some footprints are quite plain and life like whilst others are more heavily embellished and contain many extra features – this characteristic of embellishment occurred from c. 100 B.C. until the 5th Century AD in Sri Lanka and Southern India. The first Buddha footprints appeared during the earliest period of Buddhism which ended around the 4th century A.D. In Thailand, the oldest known Buddha footprint, dating to 600 A.D., is located at Sar Morakot, Khok Peep District, Prachinburi province with the most beautiful dating from the Sukhothai period, and are based on the Sri Lankan Therevean Buddhist traditions. The most beautiful however is the Buddha footprint presented to Her Majesty the Queen of Thailand on the occasions of her 60th birthday. It measures 50 cm by 140 cm and was made in 1991 from pure gold and by one highly skilled craftsman. It is housed within a private hall adjacent to the Royal Chapel ,GrandPalace ,Bangkok. The largest Buddha footprint in the world is at Pakhan-gyi,Burma. On nearly every Nepalese stupa there are giant pairs of eyes staring out from the four sides. These are known as the Buddha (or Wisdom) Eyes and they gaze thoughtfully in the four directions symbolizing the all seeing Buddha. These are so commonly depicted that they have become an essential symbol of Nepal. 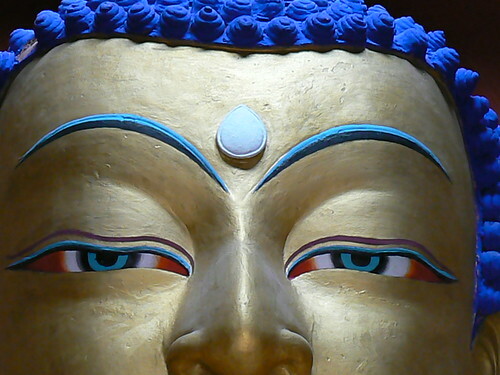 Between the Buddha's eyes in place of the nose is a curly symbol similar to a question mark. This is the Nepalese symbol for number 1, symbolizing unity of all the things as well as the singular path to reach enlightenment through following the teachings of the Buddha. Depicted above is a third eye, symbolizing the all seeing wise thinking of the Buddha. 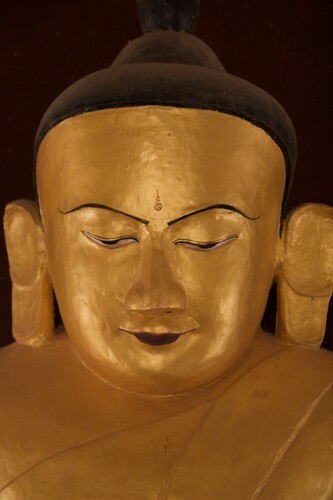 The distinctive ear lobes of Buddha statues are nearly always shown elongated. This represents the renunciation of the Buddha’s past life as a Prince when he had worn large ear jewellery – the standard attire of a Prince for that time. When he renounced his former life he stopped wearing them but his ears were left stretched and elongated as a result. Just before the Buddha attained enlightenment, he was offered a bowl of milk rice by a young lady named Sujata. He was eating very little at the time in order to enhance his meditative practices but realised he would have to eat more if he could take the final steps to enlightenment. When he reached enlightenment he threw away a small amount of rice left in his bowl to signify his denunciation of all material possessions. It is deemed to signify the middle way in between the extremes of complete austerity and complete attachment to life. The middle way is a key principle of Buddhism. The bowl also signifies the monk's daily way of life - from the monastery to the village of town at the start of each morning and surviving on the food put into the bowl by the laity. Standing statues of the Buddha walking carrying his alms’ bowl are common in Thai and Laos styles. A stupa is a mound-like structure generally containing Buddhist relics. They came to represent the Buddha’s enlightened mind and have been built since Buddhism’s early days. 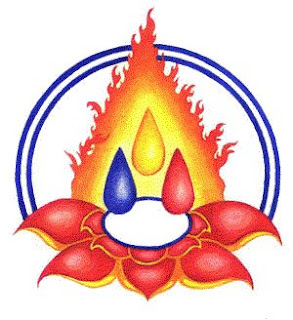 They have a number of symbolic meanings – one is that they represent the five elements with the square base representing the earth, the round dome represents water, the cone like shape represents fire, the canopy represents air and finally the interior volume of the stupa is that of space. They are often used as a reliquary for the remains of important Buddhist teachers. The Buddha's first teaching took place in a Deer Park. Buddhist mythology suggests what he spoke was so wondrous and his demeanour so peaceful and tranquil that even the animals came to listen. Statues and images of the deer are common in temples throughout the Buddhist world. Buddhism’s main philosophy is represented by the three pillars of the Buddha, himself – the Enlightened One , the Dhamma (the teachings) and the Sangha (the community of monks and nuns). These three pillars are what has sustained and allowed the practice of his teachings to prosper and thrive up to the present day. 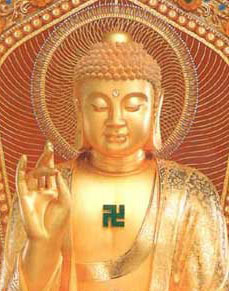 Reviled nowadays as the hated symbol of the Nazis it is also the well known good luck symbol from India. In Sanskrit it is regarded as a symbol of "conducive to well-being". In Buddhism it represents the feet of the Buddha and is often used to at the beginning of sacred texts. It is also used in Modern Tibetan Buddhism as a decoration for clothing and spread with Buddhism to China and Japan where it symbolises plurality, abundance, wealth and a long life. It is particularly common on Buddha statues and images throughout India and China. It was in designed in 1880 by Colonel Henry Olcott, an American journalist and was first unfurled in 1885 in Sri Lanka and represents a symbol of faith and peace. It has reached universal acceptance throughout the world to represent Buddhism. The Lute represents joyful sound. The Incense Burner symbolises fragrant smell. The Fruit represents delicious taste. The Silk represents the sense of touch. By offering these qualities the offerant meditates on their nature and the desire to abandon craving for earthly desires. The Mirror represents the Truth Body of the Buddha, having the aspects of purity wisdom. Curd – this pure white food is the result of a long process, so the clear nature of mind is revealed with practice over time as the obscurants are removed. Durva Grass is very strong and long lasting and is thus a symbol of long life. This is considered good because the devotee requires time to practice and attain enlightenment. Wood Apple is offered to remind the devotee of the emptiness and conditional nature of all actions in terms of dependant origination. Vermilion/Cinnabar are each red powders. 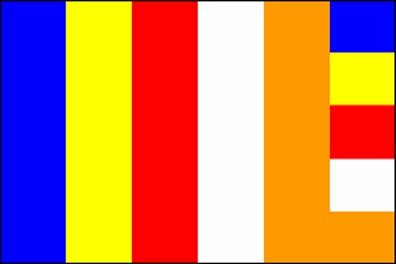 In Buddhist colour symbolism, red represents control - having control over one's actions will assist in the effort of gaining enlightenment. White Mustard Seeds - this relates to the Buddha's response to a woman who came to him deeply upset at the premature loss of her child. He told her to collect a mustard seed from each house in which no-one had ever died. She came back empty handed. The Buddha taught her that she was not alone in her grief and that death is an essential part of life. Precious Medicine - is a soothing and strengthening medicine obtained from gallstones in cattle. The medicine’s ability to heal and allay physical suffering represents including suffering as part of the practice of Dhamma. Making offerings is a very common oriental practice. Each offering has a different meaning e.g. offering light would be to banish the darkness of one's ignorance, incense would be to increase one's ethical behaviour. By giving offerings it is thought will be a good way to guard against greed and attachment. In Thailand the act of offering is called Tam Boon or merit making where food and other essential items are offered to monks and Buddha images and statues in the temple compounds. Making an offering of water which is clean, fresh, cool, smooth, light, delicious, comfortable are the qualities of auspiciousness. This is usually clean water mixed with incense and is given as an offering to the feet of all enlightened beings – symbolising purification. By performing this act we help to cleanse our own negative karma and are in essence cleaning the "feet" of our own mind. Represents generosity and the opening of the heart. Represents ethical morality and personal discipline. Represents the stability and clarity of patience the beauty of which can dispel all ignorance. Particularly the fragrance from saffron or sandalwood. This signifies perseverance or joyful effort. It is through this that, one can develop and reaches all the qualities of enlightenment. Food having many different tastes represents Samadhi, which is a nectar or ambrosia thus feeding the mind. These can include cymbals, bells, guitars and lutes. They represent wisdom, which is deemed to be making an offering to the Buddha’s ears. Bespoke design available, from small buddha statues to large buddha wall art in colours from natural wood to gold ,all carved by our Buddhist artists and 100% fairtrade.